GE Intelligent Platforms recently announced the fully managed NETernity GBX460 rugged 6U OpenVPX Ethernet switches featuring the innovative OpenWare switch management capability from GE. The GBX460 adds to GE’s already comprehensive range of high density 10GigE solutions targeted at demanding high performance computing (HPC) and networking applications such as communications, ISR and radar. These GBX460 Ethernet switches supports high throughput interprocessor communication (IPC) between 10GigE-enabled processing nodes for deployed network-centric defense and aerospace applications. With non-blocking 10GigE ports, these Ethernet switches provide high performance throughput across the VPX backplane as the switches are free to pass traffic across all 10GigE ports at wire speed without bottlenecks. The GBX460 Ethernet switches can support multiple OpenVPX slots and module profiles for optimum flexibility and throughput. The standard build provides 20 x 10GigE data plane fat pipes and 16 x 1 GigE control plane ultra-thin pipes to support multi-board 6U VITA 65 system configurations. 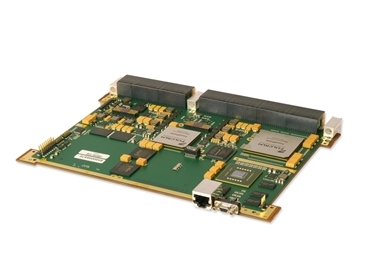 These multiboard systems require the GBX460 together with GE processor cards such as the SBC622 Intel Core i7-based single board computer and IPN250 and NPN240 NVIDIA CUDA GPGPU processors to reach high levels of performance for size, weight and power (SWaP) constrained applications, including deployed image, radar, sonar and signal processing. The integrated OpenWare switch management environment is comprehensive and powerful, providing services such as configuration, monitoring, switching control, addressing, routing and all supported protocols. Configuration and monitoring functions are accessible from a serial console or via a network. Supported access methods include Telnet, SSH and SNMP.